Want to eat some locally-caught fish, help feed the hungry and do your part to eliminate an invasive species? If so, then the Arlington Farmers Market in Courthouse has just the fleshy bottom-feeder for you, starting tomorrow. The weekly farmers market, which runs on Saturdays from 8 a.m. to noon in the parking lot at the intersection of N. Courthouse Road and 14th Street N., is adding blue catfish to its offerings. 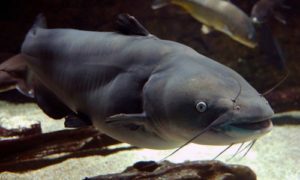 In a press release, farmers market operator Community Foodworks says blue catfish tastes “delicious.” Knowing that eating it will help rid the Chesapeake Bay of an invasive pest will make it taste even better. Plus, for every pound of blue catfish bought at the farmers market, a portion will be donated to local anti-hunger groups. The Arlington Farmers Market, located at Courthouse Plaza for over 35 years, is joining forces with Charlottesville-based fisherman Zac Culbertson, of Cold Country Salmon, and Maryland’s Wide Net Project to introduce residents to the joys of eating wild blue catfish as the best way to support local fishermen, eliminate invasive species and combat hunger. Introduced to certain Virginia tributaries in the 1970s for recreational fishing, the blue catfish (ictalurus furcatus), North America’s largest, now outnumbers other fish 3-to-1 in bay tributaries. The Wide Net Project was founded to turn the plentiful, delicious fish into an affordable source of protein for both anti-hunger relief and paying customers. For every pound of catfish Arlington Farmers Market customers purchase, WNP will donate one portion to local anti-hunger organizations such as Miriam’s Kitchen and Martha’s Table. As part of its mission to support regional food producers, Arlington Farmers Market recruited Culbertson, who runs a small acreage farm and travels to Bristol Bay, Alaska every summer to net salmon from a biologist-managed, sustainable fishery on the Ugashik River. Culbertson returns his “Beyond Sushi Grade” salmon, which is frozen immediately after catch, to Virginia where he produces salmon spread, salmon cakes, salmon animal treats, spices, and glazes. Beginning November 7 at Arlington Farmers Market, Culbertson will sell Wide Net Project blue catfish, his wild salmon and salmon products and Virginia oysters from Seaford Oyster Company in Seaford, VA.